Photo taken at the DMZ. Boys having fun on one of their tanks! I can hear the roar of jets, most likely military jets, flying overhead as I sit down to write this post. They have been performing drills seemingly nonstop for the past few days, and I find the sound to be more heartening than threatening. The nearest military base is in Seryu, which is a few miles away (about 15 minutes via a walk to the subway station and riding one stop over). This military base is also the place I should go to in the case that war truly does break out. North Korea has a long history of doing exactly what they are doing right now. They make threats, they increase tensions, they shoot off rockets and claim that they are going to fire them at South Korea. And as soon as the tension is so high you think war is imminent, they acquiesce to China and the US, graciously accepting their food aid and money in exchange for ending their rocket testing and nuclear program. People in North Korea are starving. The state has an iron grip on their food supply, and there are areas which experience "micro famines". Reports of cannibalism are not unheard of, and there have even been recent reports of this happening. Check out this article entitled "The Cannibals of North Korea" from the Washington Post: http://www.washingtonpost.com/blogs/worldviews/wp/2013/02/05/the-cannibals-of-north-korea/. North Korea is not in good shape right now, and they are looking for handouts from other countries to keep their people from starving. 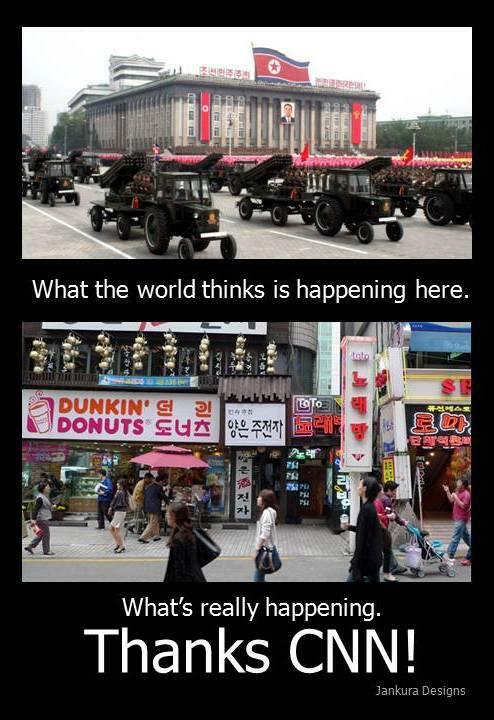 Walking around South Korea on a daily basis, there is no sign of panic. The weather is finally warming up. The Maehwa blossoms have bloomed, and the cherry blossoms are starting to hit their peak--Korea is absolutely beautiful in the spring. The only people talking about North Korea on a regular basis are the expats, who have an onslaught of panicked friends and family back home pleading with them to come back home, come back to safety. And some of them do. I heard of a friend of a friend who, at the urging of her mother, informed her school that she was going back home on a Monday and left that same week on Thursday. The Korea Tourism Organization said the latest torrent of North Korean threats has so far had little effect on that industry, with the number of Chinese visitors doubling during a vacation period last week, according to Lee Kwang-soo, a spokesman for the group. Still, it was taking precautions, reaching out to foreign tourist agencies to inform them that it was safe to visit South Korea, he said. As far as I'm concerned, I am safe here. There are military bases very close by, the US and South Korean military have been drilling together, and the Korean news outlet has issued assurances that they are prepared for anything that might happen. And if that safety net fails, I do have an escape plan and I am registered with my embassy. So I will continue having fun with friends, going out for dinner (especially at my favorite Indian place, pictured left), doing touristy things, and taking thousands of pictures. You might be wondering, what action will be enough for me to leave South Korea? If the DMZ is closed, then I will leave. I will be on a plane immediately; in fact, I already have a list made of the quickest things I can pack in order to flee if need be. For now, though, I think that this increase in tension is simply macho posturing by a spoiled young boy that isn't getting what he wanted.